I decided to seek out the best restaurants in Rovinj and to share them with you. Actually, Rovinj restaurant scene is not that bad. There is definitely a handful of the restaurants in Rovinj that will satisfy any foodie. However, don't just pick any restaurant in Rovinj because of its superb curb appeal. Located at the seafront, within the old town, or overlooking it, they all have amazing setting. You can not easily distinguish just by its look, whether the restaurant is good or not. However, don't get fooled by a charming terrace, many are just mediocre places catering to tourists. Here is my list of restaurants in Rovinj worth seeking out. Ranked number one restaurant in Rovinj and number two in the entire Istria on Tripadvisor, restaurant Monte offers excellent food and atmosphere. The restaurant is located in a tiny street in the old town. It offers fix 5- course and 7-course menu, as well as a la carte menu. Service is very attentive. Restaurant Monte is super expensive, but it is well worth the money. Restaurant Puntulina is a bit pricey, fine dining restaurant with an excellent food, and an amazing location right at the waterfront. This restaurants trades heavily on its location. Located at the top of the Santa Croce Street, Puntulina has terraces that cascade down the rocks to the sea. Great place for a romantic diner. Restaurant Wine Vault is relatively new French restaurant located at the luxury hotel Monte Mulini. The chef is Tom Gretic, known in Croatia for its appearance in the TV show Masterchef. Nice atmosphere, great food, good service. Pricey. Restaurant L is a located at new 5 star design hotel Lone. Restaurant L seeks to position itself as unpretentious, yet elegant, fine dining establishment with fusion food designed to delight the eye and palate. Restaurant E is also located at 5 star design hotel Lone. I solely recommend it because it is one of the rare restaurants in Istria (if not the only one) offering sushi, although only on Friday. Well for raw seafood lovers, restaurant E is the place to go on Friday. Take away is also available. Tavern Kantinon Rovinj is located at Rovinj's waterfront, overlooking the old town. Tavern Kantinon offers cozy and casual atmosphere featuring typical decor of an Istrian tavern. Its dishes are based on fresh, local produce. I enjoy the place mostly for the atmosphere, as the quality is somehow inconsistent (sometime it's great, and sometimes not so great). Pizzeria Da Sergio is located in the Grisia Street, in the old town of Rovinj. Pizzas are excellent with thin crust and wide choice of toppings. This place gets really busy during the summer, so expect to wait for a table. Restaurant Orca is located in the residential area of Rovinj. It is a family-run restaurant serving Istrian and Mediterranean dishes. Produce is fresh and local. It is honest, homemade food. This restaurant is very popular among locals. Restaurant Giannino is located at the quiet residential street within the old town. It has a lovely outdoor terrace, serves sublime seafood (and few meat dishes). Service is friendly, prices affordable. Make sure to taste their baby shrimps in vinegar. Restaurant Barba Danilo is located at the outskirts of Rovinj, within a small, family-run campsite Ulika. The place is equally popular for its fish and meat dishes. Everything served here is fresh, tasty and locally sourced. The restaurant has a lovely terrace for dining al fresco. Restaurant Male Madlene is a special little place in the old town. The restaurant has only 3 tables and it serves finger food. Food is tasty and beautifully arranged on the plate. However, it is a bit expensive and portions are small. Good place to go for a pre dinner snack. Restaurant Lanterna is located on the nearby St. Andrew Island (Red Island). This classy restaurant has a wonderful seafront terrace, and it's situated in an old castle dating back to the late 19th century. This is a perfect place in Rovinj for a romantic dinner. It takes twenty minute by boat to reach the island. Boats depart hourly from April to October. Have you tried out any of these restaurants in Rovinj? Do you have any other restaurant in Rovinj to recommend? Let us know in the comments below. Restaurant Graciano is excellent, great venue, fantastic view of the harbor, delicious food and friendly waiters. Graciano has it all for a moderate price. Tipico Old Town is also worth trying. Thanks for the additions, Miklos! I highly recommend Male Madlene Restaurant, we dined there tonight and it was one of those never to be forgotten experiences. Tiny, exquisite, only 3 or 4 tables, food cooked with love and the setting sublime sitting right on the waters edge watching the sun setting. A four course dinner either fish or meat, made fresh just for you and light,tasty, delicious, it was lick the plate, my highest award. Ulica E. de Amicisa – Via E. de Amicis 16, Rovinj. My partner & I sampled the delights at the Lanterna restaurant last year whilst staying at the Hotel Istra. It was our last night there, so decided to have a special meal in beautiful surroundings. We were not disappointed, the food was excellent, as was the service! We watched the sun go down as we dined…couldn’t have asked for more! Would definately recommend! What delights are we needing/ must seeing in and around the area. Is the public transport system easy and reliable to navigate? Hi MIlvia, thanks for stopping by. Great choice of destination and the hotel. Monte Mulini is one of the best hotels (perhaps the best) in Croatia. You can do it without a car: you can visit local islands: St. Andrew’s (or Red Island), and Sv. Katarina. Both islands are small, and each feature a hotel. But they have lovely parks, and on Red Island there is a nice restaurant – Lanterna. You can arrange olive oil tasting and / or wine tasting with a hotel, or two wine bars in town (San Tommaso and Piassa Grande). 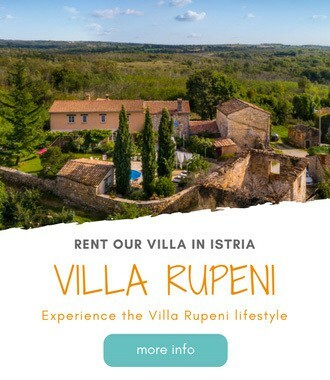 However, maybe you can rent a car for a day if you’d like to visit Istrian hinterland: like hilltop towns of Groznjan and Motovun; or to visit an olive oil producer (we recommend Chiavalon in Vodnjan), or wine producer (like Kabola, or Kozlovic). Have a great time and let us know if we can help with anything else. Hi Frank! We discovered your blog just in time for our 10 days in Croatia. We are in the midst of trip around the world. Rovinj was a highlight to be sure, and we arrived just in time for the St Euphemia festival, complete with wine tasting event and grape stomping competitions. We loved our time there, even though it was hard to pry ourselves away from Hvar. We’re writing about our travels at ashlanddispatch.com if you want to take a look! We’d love to collaborate, if you are interested please get in touch! Frank, I am planning a trip in the fall to Split , Dubrovnik and Hvar. But besides fresh seafood I am also a lover of porcini mushrooms (experienced in Italy last year and still dreaming about) and I understand these are to be had in the Istrian peninsula. So now I am thinking of adding Rovinj as a fourth base for my trip, just for this reason. Trying to find more specifics through Google I came up with little information. Can you give me any insight when and where I should go porcini (and maybe even truffle) mushroom dishes? Hi Razvan, porcini mushrooms you can find in Istria. Many tavern serving traditional dishes serve them. I believe they do have them a year around. Usually thy serve them with pasta. Check the tavern Stari podrum in Momjan. Just email them and ask if they have porcini at the time you’ll be visiting. They can even put some aside for you. You can also check with tavern Toncic in Zrenj. And tavern Nono in Petrovija. Let us know if we can help with anything else.